When guests are in town, I love to show my guests the gems that make up the Bay Area. My mom was visiting, and since she’s been here a number of times, we decided to do something a little different. We set out for Old Sacramento, to introduce her to a different California, a California steeped in rich frontier history. Old Sacramento is a National Historic Landmark District that was preserved, and restored to resemble Sacramento in the 1860s, during the heart of the Gold Rush – sidewalks are wooden, buildings have that “old-timely” feel, and there is a horse drawn carriage you can pay to ride around town. Right on the edge is a statue dedicated to the Pony Express riders. 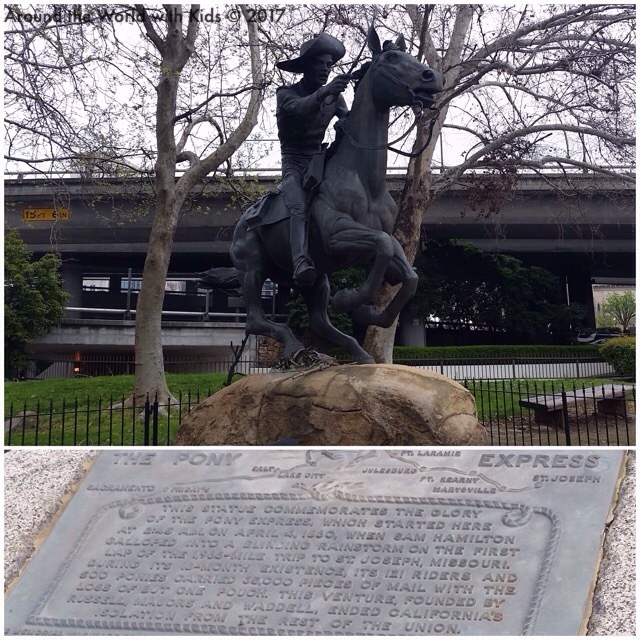 Sacramento was the end of the line for the Pony Express, where riders took turns riding approximately 1,900 miles to bring the mail, packages, and their valuables to settlers along the line. 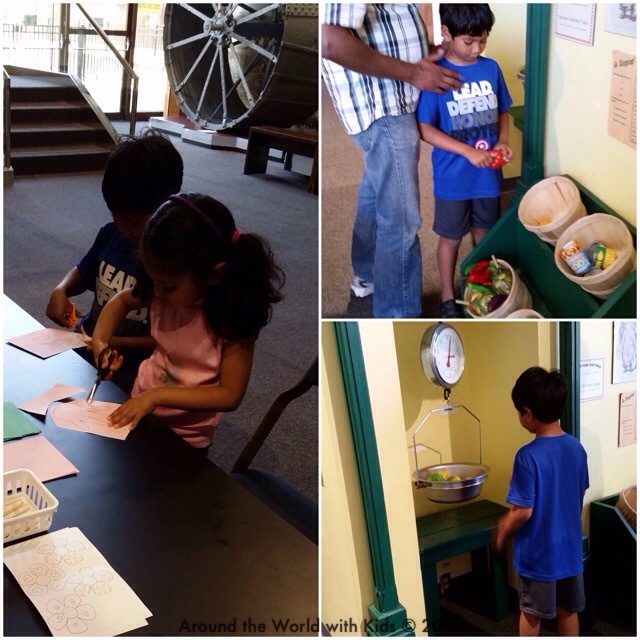 Next stop was the Wells Fargo History Museum. This is a small museum set up in the corner by Wells Fargo, which got its start in Gold Country. What I had not realized was Wells Fargo started as a secure freight operation, but entered banking when it saw the miners needed to turn their new found gold into currency. The museum gives a brief history of the company and of the time. 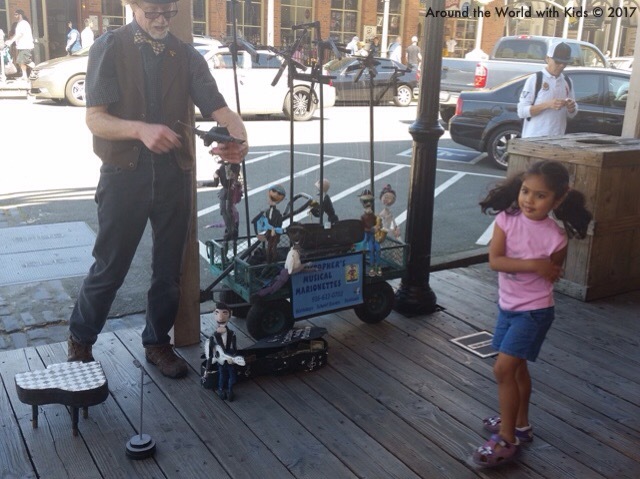 Kids can watch videos, take pictures with the Wells Fargo uniform, and write bank notes for themselves with an old fashioned fountain pen and learn Morse Code. Adults can find interesting history, and a convenient ATM right on premises. 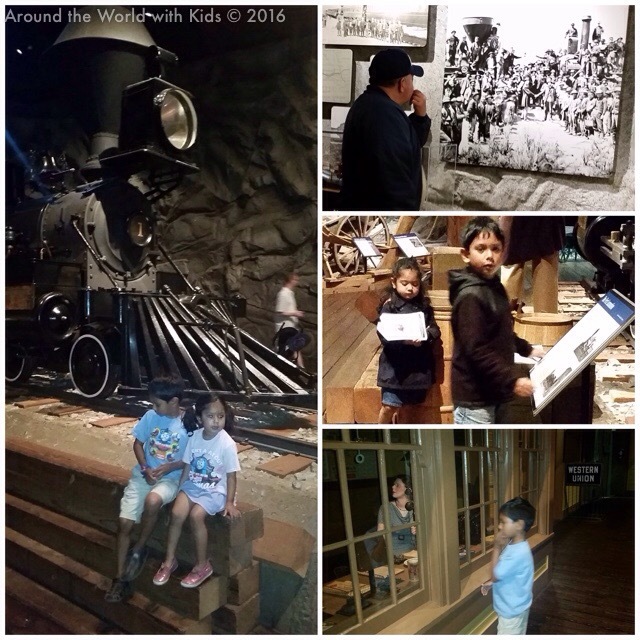 Our next stop was the Sacramento History Museum. 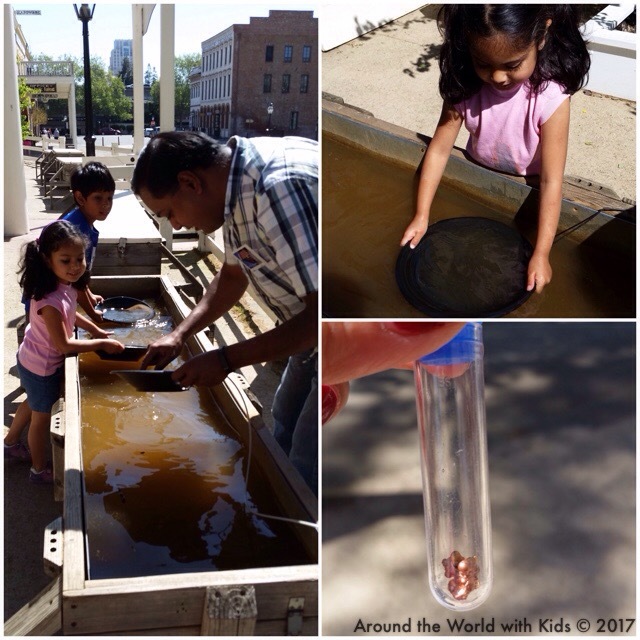 Outside the museum, there are large barrels where the kids can go panning for gold. My kiddos loved this, with my son quickly figuring out how to tilt the pan and shift it just so in the sun to see a glimmer of gold (or silver, or pyrite or fragments of abalone shells). He quickly filled his vial with his new found treasures. My daughter didn’t quite get the hang of it, ended up soaking wet, and we ended up “doing it for her”. Once they had their fill, we went inside. 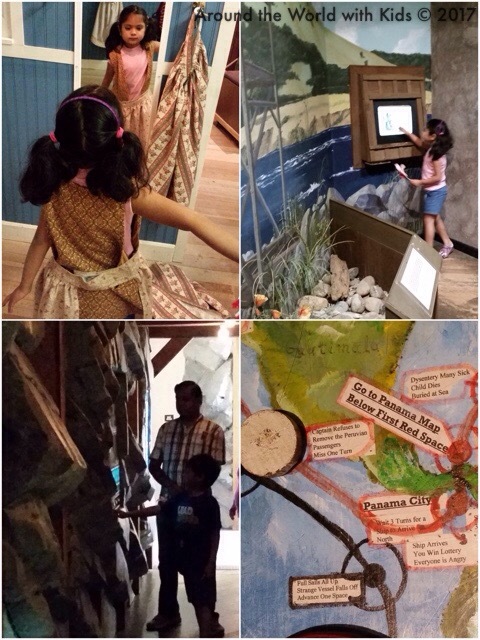 The Sacramento History Museum has a collection of permanent and temporary exhibits all which focus on the history of the Sacramento Valley. Downstairs, we saw a section that talking about the farming life of residents showed how this area became a golden area for farming. Displays showed how people canned in thier kitchen and the equipment used at the time. We also found a kid’s craft table, where kids made flower wands. There was also a fake grocery where the kids. weighed vegetables and fruit. Upstairs was a mixture of exhibits centered on the gold rush era, and a temporary exhibit on the rehabilitation of Old Sacramento. I was surprised to learn that the area had been run down, crime ridden, and set for demolition for the construction of the interstate highway. A private group came in and raised. funds to save it. They then went through a several year period to revitalize the area, moving historic buildings, refurbishing and/or completely rebuilding the historic buildings. Now, it’s a bustling tourist area, with lots of restaurants, shops, and attractions. But like many revitalization stories, it ended up displacing the very citizens it intended to protect – that information added some perspective for me away from all the touristy blitz. In the exhibits on the Gold Rush, there are displays of clothing and coaches that people once used, an area where you could touch real fur, and a fun play area where kids could try on clothing, play a board game that had the players racing to get to San Francisco via boat (just don’t die of dysentery! ), and walk through a fake mine tunnel. After the museum we went to find lunch at Sactown Sports Bar (Good burgers and great beer! ), and then made our way to the steam train. 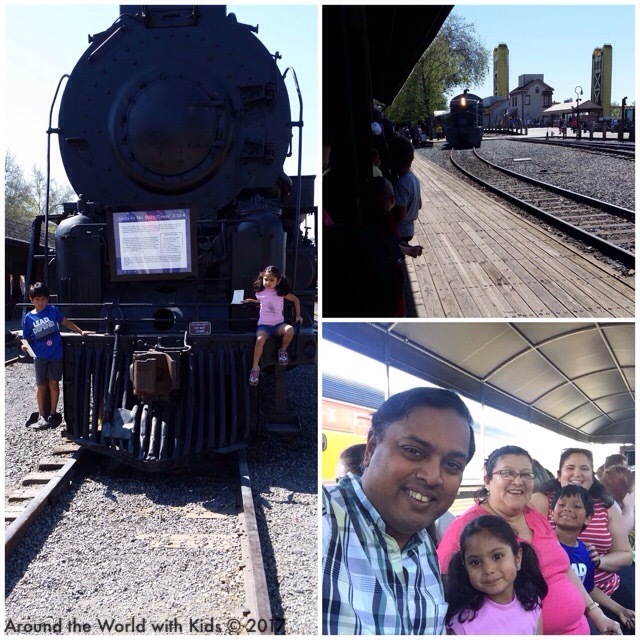 The steam train ride is one of my kid’s favorites. And quite frankly, one of mine as well. 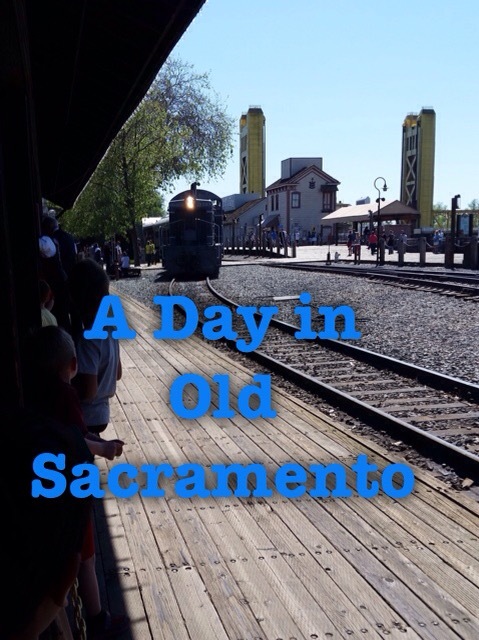 For a small price, you can take a 40 minute ride along the Sacramento River in a vintage 1860s Steam Train. There are both closed and open cars. The closed cars have traditional Pullman car seating, while the open cars have benches that allow you to look out at the view. The ride takes you up along the river bed where you can see various bridges and the lazy river as it meanders down to the bay. The kids, after a day of activity, were lulled by the swaying of the car, and slept peacefully about ½ way through the ride. 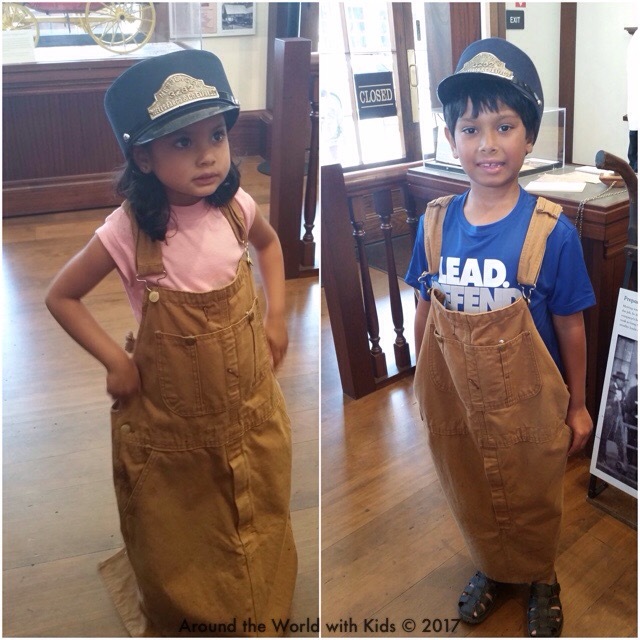 The other nice attraction in Old Sacramento that we didn’t make it to this time is the California State Railroad Museum. We’ve been a number of times, so I wanted to do something different, but the kids were sorely disappointed we didn’t go. Next trip. After the train, it was time to head back to the Bay Area. We wandered over to our car, soaking in the atmosphere and rich history. Old Sacramento reminds you of a time where opportunity seemed in the reach of anyone; where life and the future was full of endless possibilities. You can see how it shaped the attitude of future Californians who continue to see this area as a place where anything is possible. Times: Every Saturday and Sunday, April 1 – October 1. Trains leave every hour on the hour, with the first train at 11am, and the last at 4pm. Seems like a great museum to take the kids to!